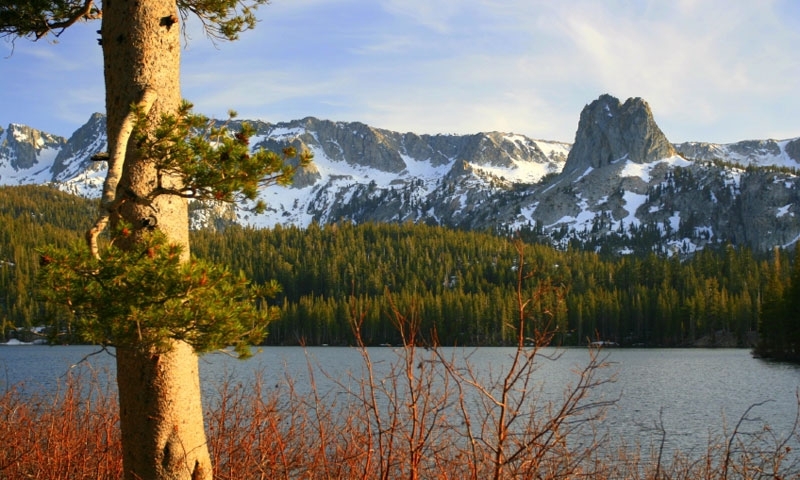 If you’re looking for a place to experience all that the eastern Sierras have to offer, including scenic hiking, abundant fishing and lakeside camping, all within a stone’s throw of town, the Mammoth Lakes Basin is your destination. Lake George is a great jumping off point for a hike to the Upper Lakes Basin. The trails for Crystal, T.J., and Barrett Lakes all leave from the parking lot. Camping, fishing, and paddling are popular activities here as well. This is the smallest lake in the area, and is well known for its trout fishing as it’s regularly stocked with large brown and Alpers trout. Locals say dusk is the best time to fish here. At over one mile wide, this is the largest lake in the Mammoth Lakes Basin. The campground located here has 51 sites sprinkled along the shoreline, but beware, it fills up quickly during the summer. This is also the best lake in the area for sailing. This lake is home to the largest campground in the area, with 95 sites available on first-come first-served basis. Twin Falls, a beautiful 287’ waterfall is also a must see here. If you’re looking to cool off on a hot summer day, Horseshoe Lake is your destination, as this is the only lake in the basin that allows swimming. If you’re looking for something a little more active, Horseshoe Lake Loop is a popular 7 mile mountain bike trail that runs around the lakes perimeter. These beautiful backcountry lakes offer visitors a measure of solitude not often found so close in to town. Destinations include Crystal, Skeleton, Barrett, McCleod, and TJ Lake, all accessible on relative short hikes. Mammoth Lakes, California is a town of about 7,000 people and known for having many hot springs.